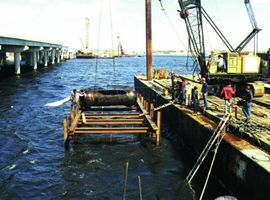 Hudson Marine provided all underwater services for the repair of the North Channel 48-inch watermain break in Jamaica Bay , NY. The pipeline was sheeted, excavated, cut and spliced with new ductile iron sections. All repairs were accomplished underwater.